As promised, this one is from our small group’s Indian Food Night (you can see a separate post all about that here!) Originally I was going to make my sweet potato masoor dal, but then I looked at the weather and realized that we’re not in winter anymore here in Durham. The trees are budding, the sun is out, and the breeze is warm. Spring has finally sprung! Because a lot of our small group friends were making hot dishes and stew-like things, I thought a lighter salad would be a welcome addition. 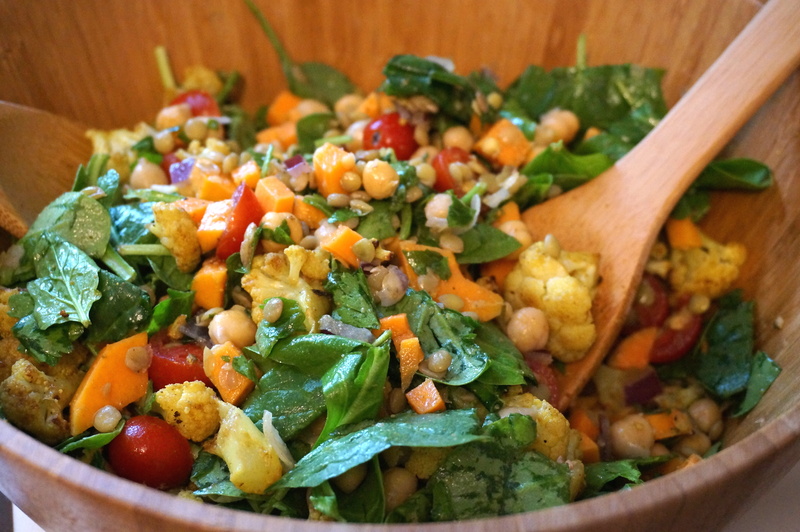 Packed with protein and a delicious blend of Indian spices, this salad is sure to satisfy even the biggest appetites. 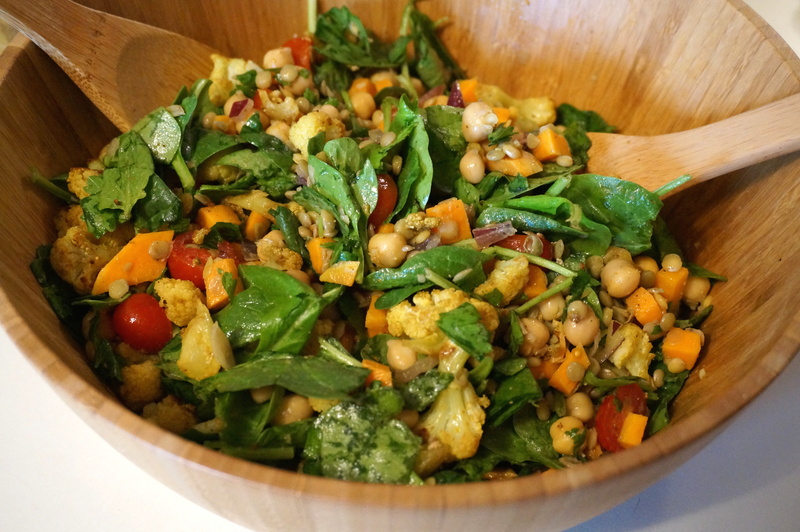 I love the combination of the light, zesty lemon-cumin vinaigrette with the curried cauliflower (adapted from my sister’s recipe), and the lentils, chickpeas, and sweet potatoes add bulk and heartiness to the dish. Finally, the tomatoes, red onion, spinach and parsley finish it off with a touch of freshness. 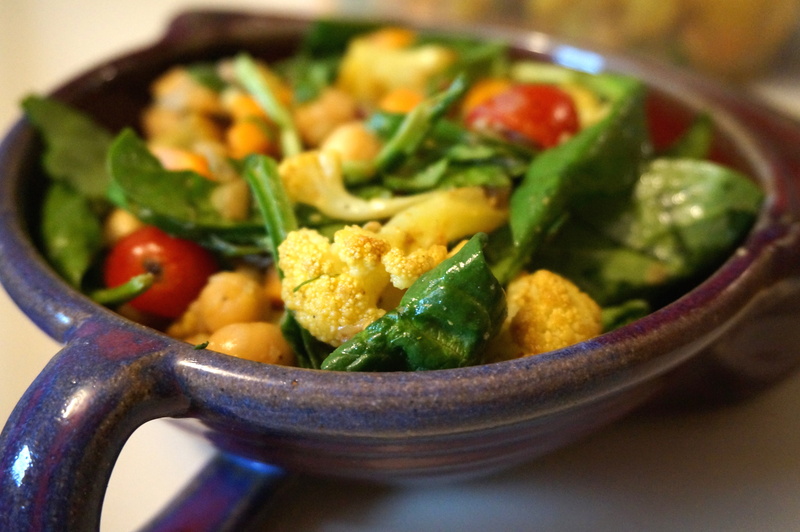 Here’s an easy “power salad” recipe, chock-full of Indian-spiced chickpeas, lentils, and curried cauliflower! The zesty lemon-cumin vinaigrette ties all of the flavors together to make you feel like you’ve just stepped off the plane to Dubai! 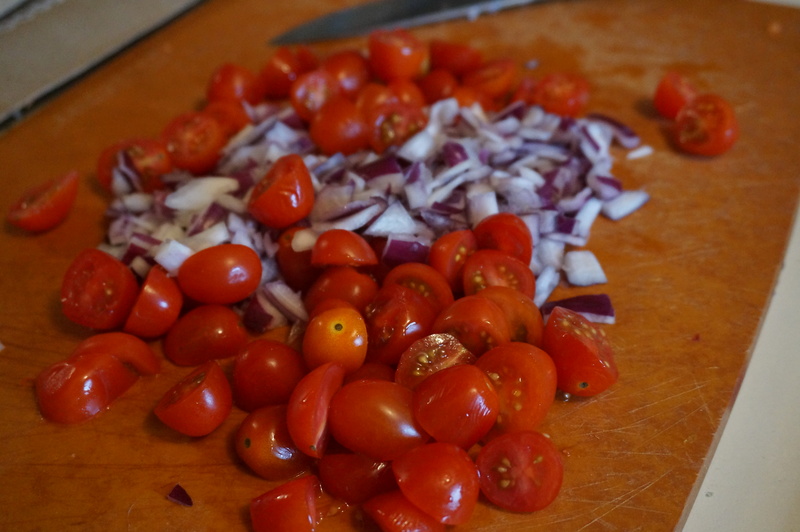 Chop up the tomatoes and red onion. 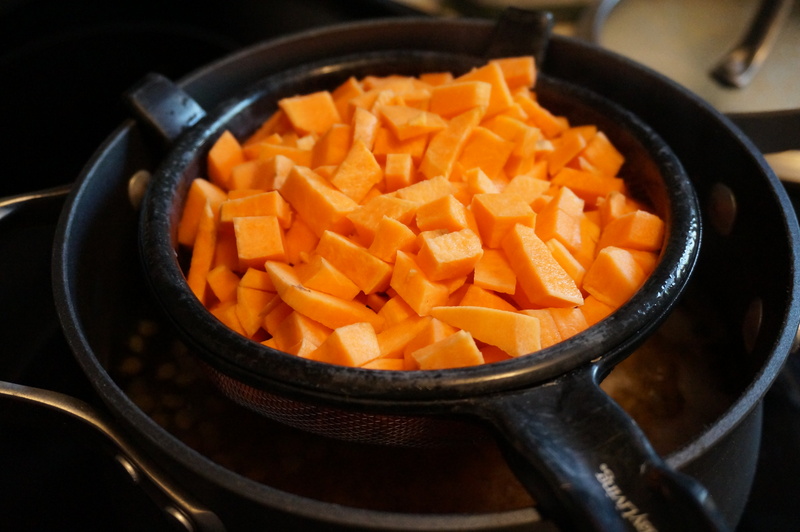 Chop up the sweet potatoes into small, 1/4″ cubes. Place in a steamer basket. Meanwhile, cook 1 cup lentils according to package directions (about 20 minutes for al dente lentils). Set the steamer basket of sweet potato chunks on top of the cooking lentils. When lentils are finished cooking, drain and rinse with cold water to stop the cooking process. Return a bit of water to the pan and bring to a boil to continue steaming the potatoes, if they are not cooked through yet. 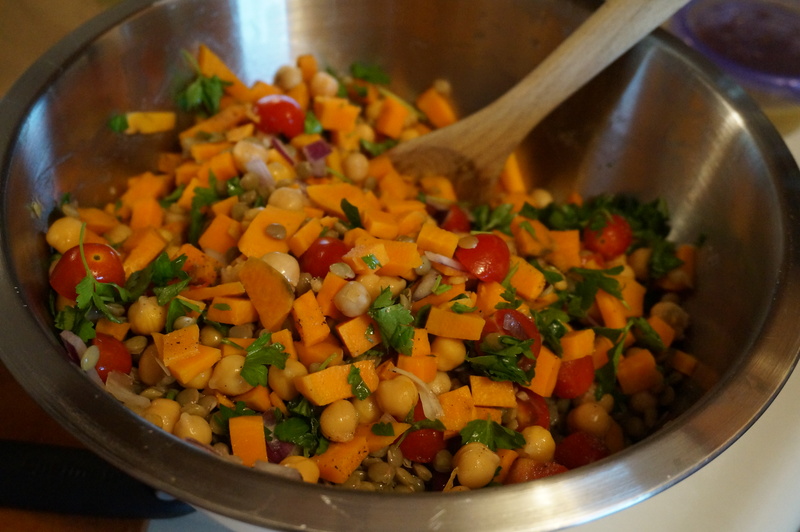 Combine tomatoes, onions, sweet potatoes, lentils, chickpeas, garlic, parsley, salt and pepper in a large mixing bowl. In a small bowl, whisk together ingredients for the lemon cumin vinaigrette: oil, juice of one lemon, lemon zest, cumin, cayenne pepper, and more S+P. Drizzle over the salad and toss gently. 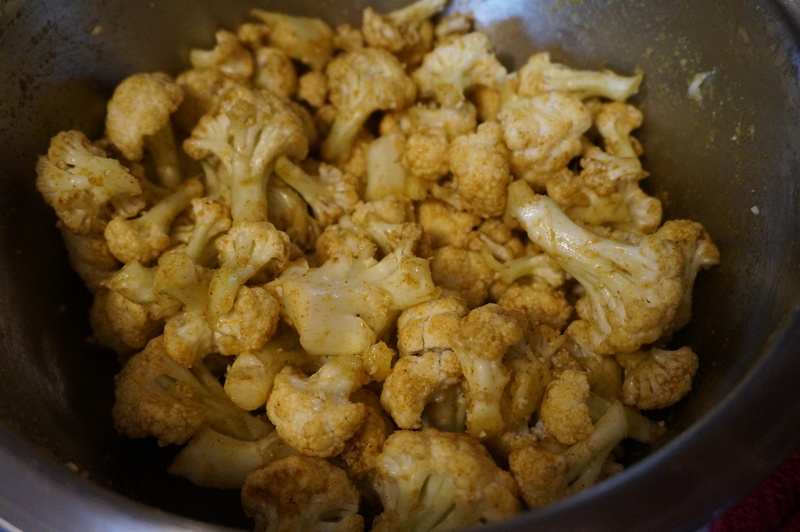 To prepare the curried cauliflower, preheat oven to 400 degrees. 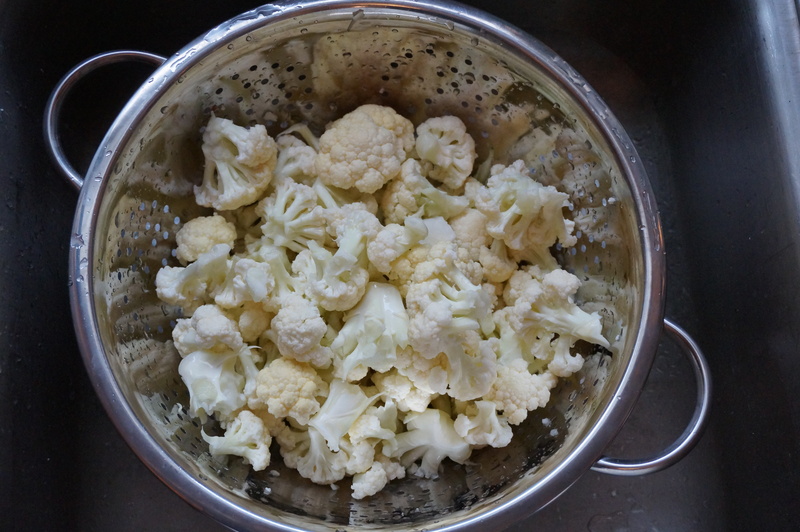 Rinse and pat dry cauliflower in a colander. 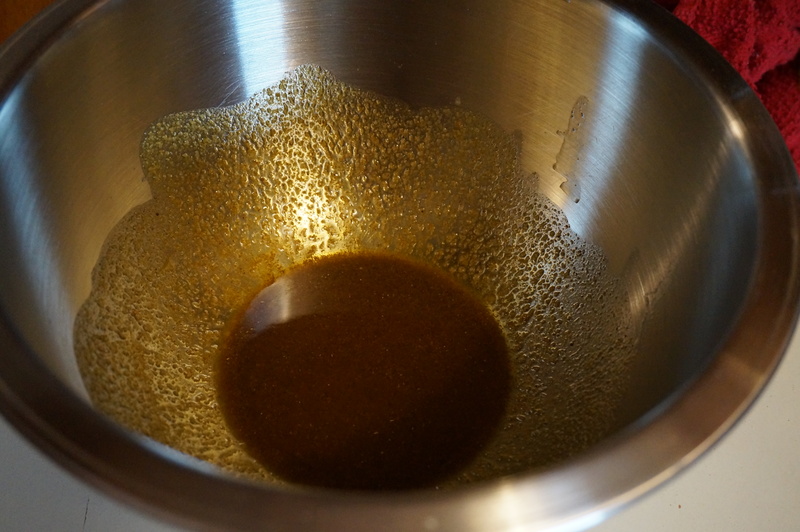 In another mixing bowl, combine 2 tbsp oil, garlic powder, curry powder, and orange juice. Whisk thoroughly. 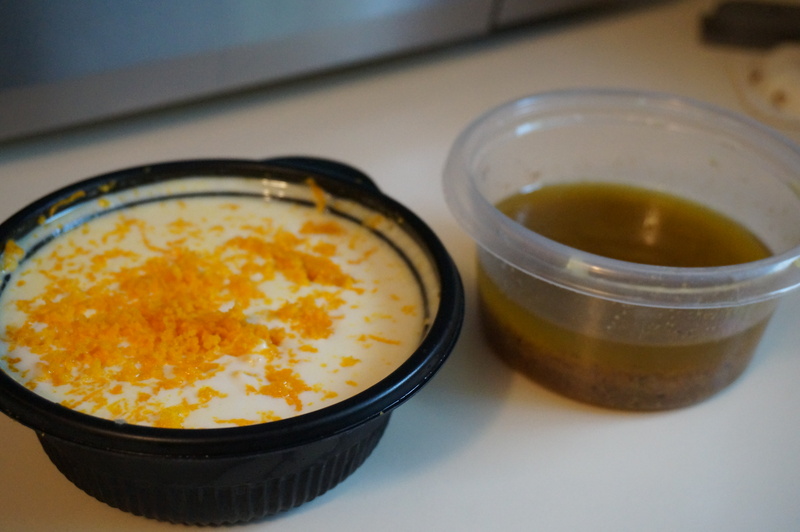 Toss in cauliflower florets and stir until each floret it equally covered with the dressing. Spread on a lined baking sheet (love my Silpat! careful of the curry staining though…oops) and roast for 20-25 minutes or until slightly browned. For the last few minutes, sprinkle on the cashews to toast. Remove from oven and let sit for 5 minutes before tossing into the salad. 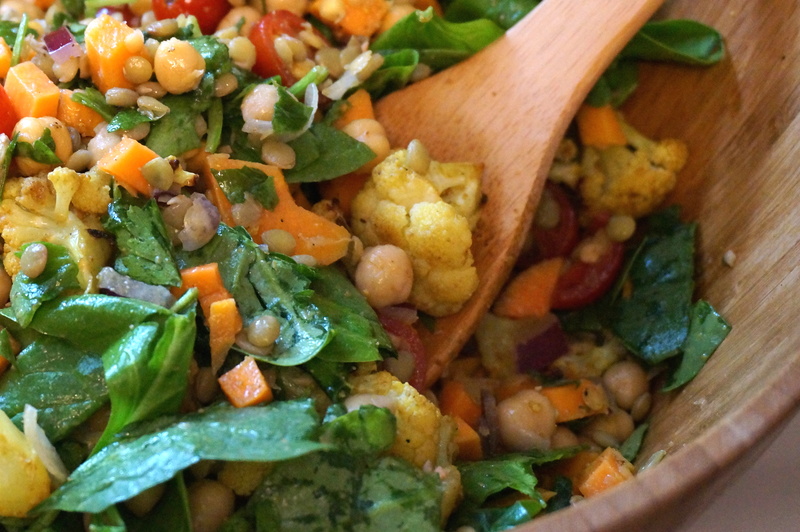 Toss in the spinach for some extra color and volume to this wholesome, protein-packed Indian power salad! Serve with naan and a poached egg on top if desired! Chop the tomatoes and onion. And sweet potatoes (not shown). Add potatoes to a steamer basket (I always use an old mini strainer!) and set on top of cooking lentils. When finished cooking, add lentils and potatoes to the rest of the veggies and chickpeas. Stir in chopped parsley and spices. 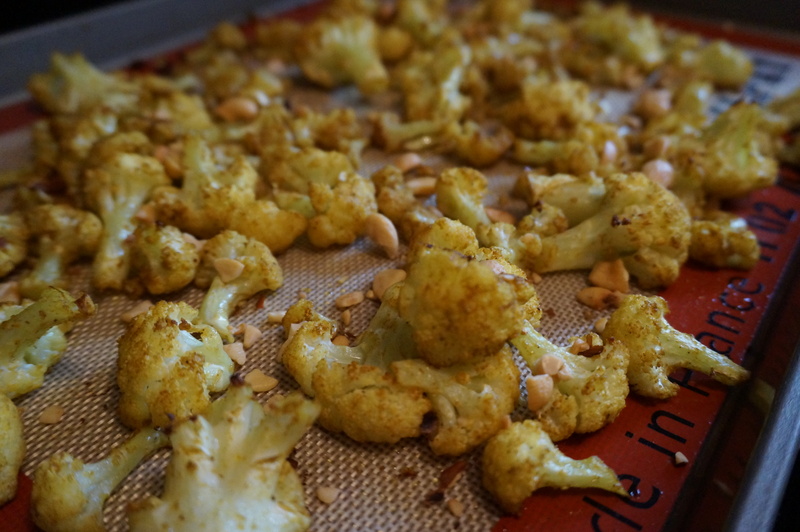 Cauliflower florets, rinsed and dried. Whisk together ingredients for the curry dressing for the cauliflower. Add the cauliflower florets and toss until evenly coated. Roast at 400 degrees for about 20 minutes, adding in the cashew bits for the last few minutes of baking. Toss into the salad with the spinach! Serve with naan as a side salad to your tikka masala, or as an entree with poached egg on top. Happy tasting! The Breaking of the Naan: Indian Food Night!